This village shows how people lived and worked since the founding of our country and is an amazing place. You won’t find any vehicles on the grounds newer than about 1920. There are Model-T’s driving people around, horse-drawn carriages, and a steam locomotive that circles around the 80-acre village. There is said to be 240 acres here with the remaining land being forest, river and extra pasture for the horses, sheep and any other livestock. One of the first things we did was board the train at the gate when you enter the village. Buy a unlimited ride pass when you get your tickets to Greenfield Village. It was only $10.00 and allowed us unlimited access to the train, horse-drawn carriage, and Model-T’s. There were three different train stations. We rode the train to the first station and then walked around the village. Before we left we got back on the train where we got off and rode the rest of the way around. There is a real working roundhouse on the grounds. You can go in it and see guys working on trains and or rail cars. While we were there they were restoring an old caboose. This turntable above is used to get the trains in there designated bay of the roundhouse. The table is turned by hand by pushing/pulling on the handle you can see sticking out above the green sign above. While we were there we saw two small girls under the age of eight turning the table on their own. It’s amazing that such a heavy steel structure can be spun around with such little force. The Greenfield Village gives you a taste of everything you would have found in this country back around the early 1900’s. Above is a covered bridge. I loved this old brick building. It is a Thomas Edison power station built in Greenfield Village in 1944. It is a partial reconstruction, one-quarter size, of Station A, the first of the Edison Illuminating Company’s early power plants in Detroit Station and one of the first electric power plant in the city of Detroit. Station A served Detroit customers with safe and inexpensive direct current (DC) electrical power for homes and businesses from 1886 to 1900. Coal-burning boilers on the first floor provided power to steam engines which were connected to dynamos (generators). 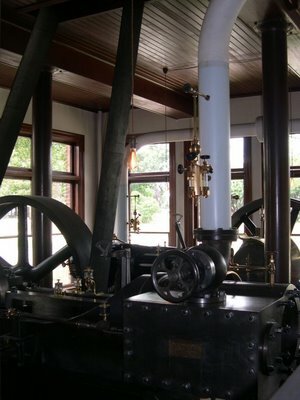 Some of the original equipment to be found from the original building are two Armington and Sims engines, the original Jumbo Dynamo from the New York building, and the Beck engine which Henry Ford repaired. Each Jumbo (generator) weighed about 27 tons and had a 10-foot armature shaft and an output of 100 kilowatts. Each dynamo was driven by a steam engine, which received steam from boilers located in another part of the plant. The first plant on Pearl Street in New York had six jumbos and was designed to run up to 1,400 lamps (light bulbs inserted into fixtures) continuously, and served an area of about one square mile. Thomas Edison’s Menlo Park laboratory complex and the inventions he made there are over 100 years old. When Edison built the laboratory in 1876, it was the first industrial research laboratory in the United States. By 1886, Edison and his entire team had abandoned the Menlo Park site. In the 1920s, Henry Ford wanted to move the old “invention factory” to his museum in Dearborn, Michigan. When Ford and Edison went to New Jersey to recover the buildings they found that most of them had been removed or had collapsed. Ford had his staff reconstruct the Menlo Park buildings from photographs and a few surviving original materials. During dedication ceremonies for Greenfield Village on October 21, 1929 – the fiftieth anniversary of the invention of the light bulb – Edison sat in the wooden armchair shown above. After Edison left the building, Henry Ford had a workman nail the chair to the floor with instructions that the chair never be moved, and never be sat in again. Over time the floor here has been replaced, but the original floor where the chair once sat is still intact. When it came time to replace the floor, they simply cut around it. This is the Orville and Wilbur Wright cycle shop and includes the room the added on the back to build their airplane. The shop includes some of the original equipment they used in its construction. In addition to Edison’s shop and Menlo Park, you’ll find full functioning buildings here for metal working, glass blowing, pottery, printing, saw mill, and more. The 1927 Ford Model T, on display at The Henry Ford, is the 15 millionth Ford Model T to be produced. This touring car has a 4-cylinder, in-line, water-cooled, 176.7 cu. in., 20 hp engine, and its price at the time was $380. It came off the line at Ford’s Highland Park, Michigan, plant on May 26, 1927, and marked the end of Model T production. Dearborn is surrounded by Ford Motor Company. It’s everywhere. While your at the far end of the village you can get glimpses of Ford’s test track. If you’re a Ford fanatic, the sounds of tires squealing on the test track can be very distracting. There is far more here to see than what I have included here. Visiting Greenfield Village takes a whole day. Even then you might not see it all if you take time out to watch all the actors put on shows re-enacting famous people at famous times. It’s also interesting to just watch people creating things in the way they were made in this time era. There are also working farms here with a variety of animals being raised and crops grown. If you like landscaping, you’ll find beautiful flower gardens and landscaping everywhere. After doing some research, I found that you can get package deals with local hotels (click HERE for more info). We chose a package with Comfort Inn. Comfort Inn was only a couple miles from the museum. For $119.00 we got a nights stay (hotel had an indoor pool, hot tub, sauna and 30-item hot breakfast buffet) and tickets for two to the Ford Museum and Greenfield Village. In comparison, tickets for two to the Henry Ford and Greenfield Village would be $74.00 plus a $5.00 parking fee. To see our trip to The Henry Ford Museum, click HERE. Find out more information on the Greenfield Village HERE.